As a growth stage company, Highspot was gearing up for its account-based marketing and sales strategy, which entailed enabling smarter account engagement and performance measurement. The company knew it needed to have its lead data connected to account data, starting at the root and foundation: the CRM database. Without connecting leads to accounts inside of Salesforce, the sales and marketing teams could not engage the right leads associated to target accounts. However, fixing this problem manually would require spending hours weekly to maintain data, hours that could be used to engage accounts. The solution had to be technology. Bryant Lau, at the time Senior Digital Marketing Manager of Highspot (since promoted), knew of Full Circle Insights since he was a previous user of Full Circle Insights at a former company. He recognized the need for intelligent technology to save the sales team hours of manual maintenance of lead and account data weekly. Moreover, he needed to track and measure performance of accounts through the full funnel. Knowing its legacy in providing the best in class for funnel metrics inside Salesforce, Bryant turned to Full Circle Matchmaker. Matchmaker’s intelligent matching automated the connection between leads and accounts, in bulk and continuously. Matchmaker was built specifically with self-customizable rules to ensure lead matching could be configured to fit a company’s lead flow and business process. Highspot was able to focus its sales and marketing teams on revenue-generating activities, rather than maintaining its CRM. Marketing efforts could finally be hyper-focused on individual accounts. Moreover, the whole organization created visibility into account performance and metrics to better steer its account-based strategy. Here are some of their results from using Matchmaker. 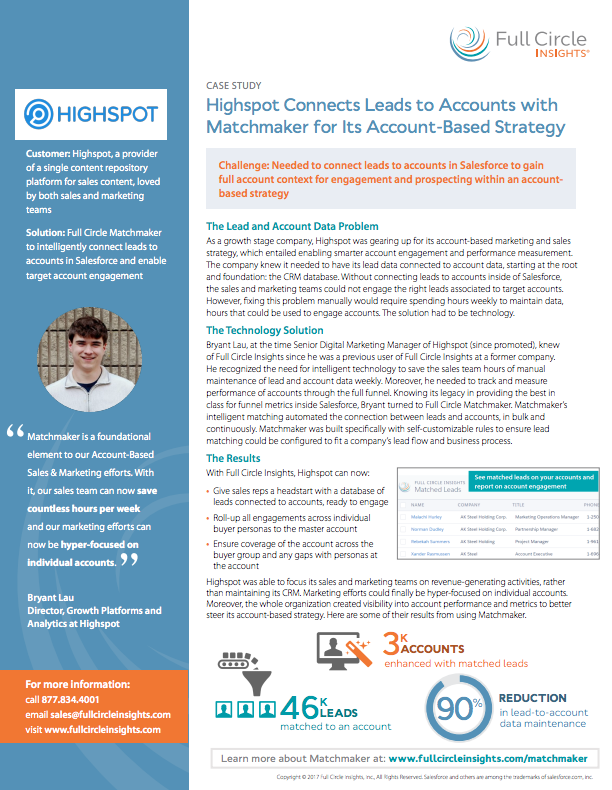 Download the full Highspot Case Study to see how Matchmaker enhanced 3,000 accounts with matched leads.